Few works in my crochet desk are still in progress.Meanwhile i wanted to do something simple and useful.Also that it is not time consuming! 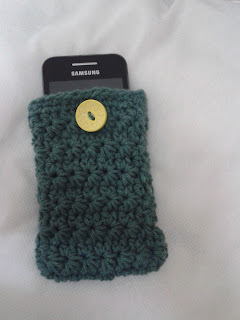 Searched the net and found the pattern for a cell phone cozy. I liked the texture of the pattern and decided to give it a try. 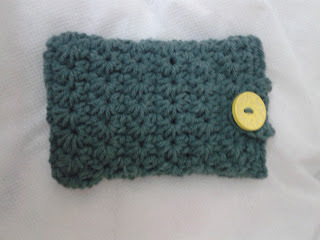 Till then i knew only few basic stitches like single,half double,double and treble crochet.Used shell stitch in one of my WIP but not satisfied with the outcome. On seeing this pattern initially I was scared. "How am I going to do such a complicated stitch? " was my first thought. With some guts,I went through the pattern and found that it is easy. Started working ,went wrong all the way,ripped it off and started again! This time it is near perfect! Wanted to give it a red/maroon colour button , but i had only yellow.So settled with yellow. i like this cozy. i also made two of them, however didn't know they are actually called "cozies":)have a nice day! wow...thanks, I know how it's important to get comments from fellow bloggers and crafters:)more to come! You are such a sweetheart Anna! Eager to see your work! Hope your new week is a great one!